Note: If you read anything on the internet, you probably know the major spoiler that follows the conclusion of the upcoming Goblin Nation storyline. If you don’t know about it yet, skip this review. Thar be spoilers. The short version – go buy this book now. If your comic store still has it, buy it. If not, break into your best friend’s house and steal it. 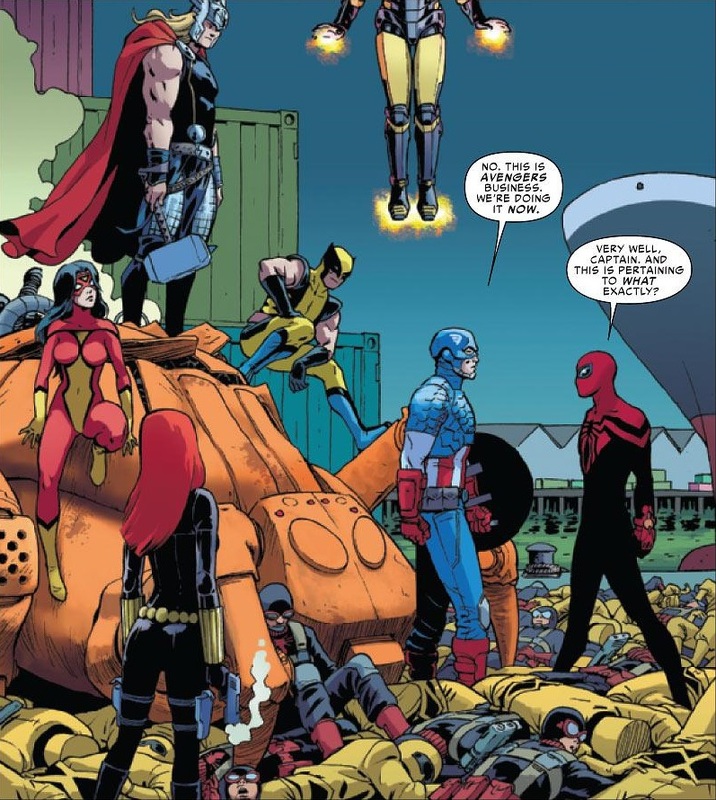 The long version – When the Superior Spider-Man team is on their A-game, it shows. And it feels like after spinning its wheels for a few issues, the book has finally gained some traction and is now ready to rocket towards the finish line. At first, I was uneasy about the book getting three artists instead of the originally-solicited Pasqual Ferry, but it’s hard to complain when those three artists are Humberto Ramos, Javier Rodriguez, and Marcos Martin. What I like about this issue is that each artist gets a part of the story to draw. Ramos gets the battle between the Green Goblin and Hobgoblin, Javier Rodriguez gets the Avengers and Ock, and Marcos Martin gets – SPOILERS – Peter Parker wandering through the metaphysical landscape of his own mind. I hate to pick favorites, but when it comes to these sections, I prefer Rodriguez’s and Martin’s over Ramos’s. Not that there’s anything wrong with his section. The normal fluidity is there, and I kind of like the bug-eyed way he draws the Green Goblin. 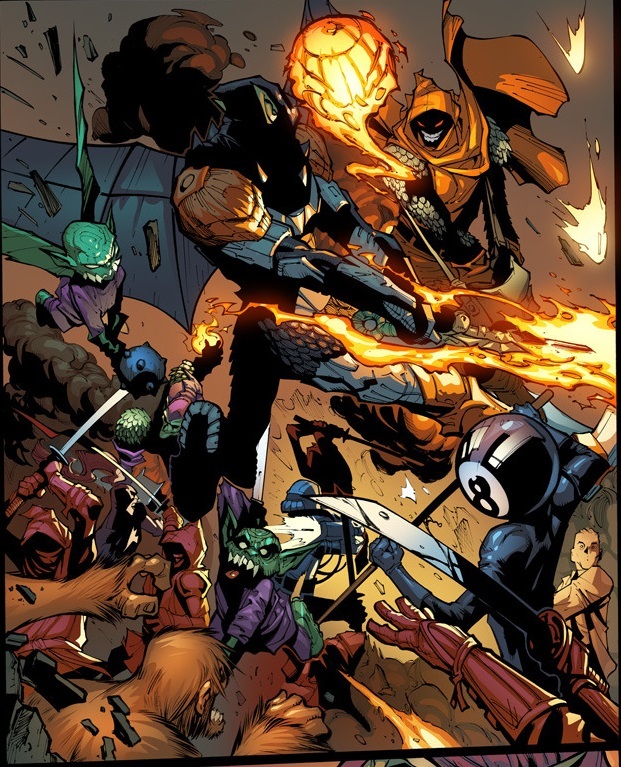 But maybe it’s just that I prefer the color choices in the Ock and Peter sections more. Delgado is a good pick for the knock-down drag-out goblin brawl, but it’s also nice to see solid colors on my superheroes for a change. I haven’t checked the solicits for the next few issues until the series’ end, but I definitely wouldn’t mind these three artists handling separate plotlines in the future. As for the story, it feels as if Dan Slott keeps returning to the vitriolic internet backlash and writing in response to that. Let me elaborate. As I said in the last review, I read a lot of Spider-Man news—from fansites, news sources, just about anywhere I can get it. And among fans, there seems to be an opinion lately that Peter Parker is not who he used to be, even before the mind-switch. So what does this have to do with Slott? Well, he takes this idea and runs with it. 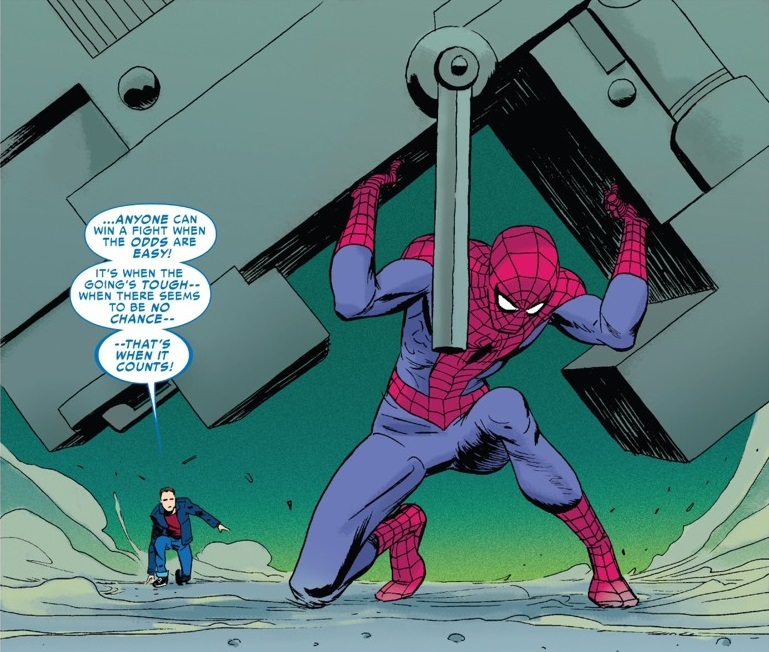 And if the events of this issue—each plotline has a significant step forward—are any indication, Slott seems to be priming Peter for a return to form. In fact, there’s so much in this series that has to do with authenticity and the question of what it means to put on a mask and to claim that identity. All of this has been dramatized through the goblin storylines, the various legacies of characters like Flash and Miguel. Heck, even Liz Allen runs a corporation that used to be named Osborn Chemical. The question we keep returning to isn’t What does it mean to be Spider-Man? It’s What does it mean to claim any identity? Even if Peter returns to being Spider-Man, what does that mean? Is Peter Parker actually Spider-Man? Or is Spider-Man just a name? 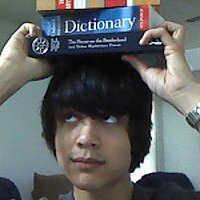 What exactly is his identity? I know, I know. This is all rather deconstructive, and hats off to Slott for making me think about my comics. But just read this issue and you’ll understand exactly why it is that I’m again so excited to be reading the Amazi—I mean the Superior Spider–Man. This entry was posted in Alvaro Lopez, Amazing Spider-Man, Avengers, Chris Eliopoulos, Comic Book, Comic Book Reviews, Dan Slott, Edgar Delgado, Goblin Nation, Green Goblin, Hobgoblin, Humberto Ramos, Javier Rodriguez, kenneth kimbrough, liz allen, Marcos Martin, marvel comics, osborn chemical, pasqual ferry, Peter Parker, Superior Spider-Man, Victor Olazaba and tagged alvaro lopez, amazing spider-man, avengers, Chris Eliopoulos, comic book reviews, dan slott, Edgar Delgado, Goblin Nation, green goblin, hobgoblin, Humberto Ramos, Javier Rodriguez, kenneth kimbrough, liz allen, Marcos Martin, marvel comics, osborn chemical, pasqual ferry, peter parker, Superior Spider-Man, Victor Olazaba. Bookmark the permalink. 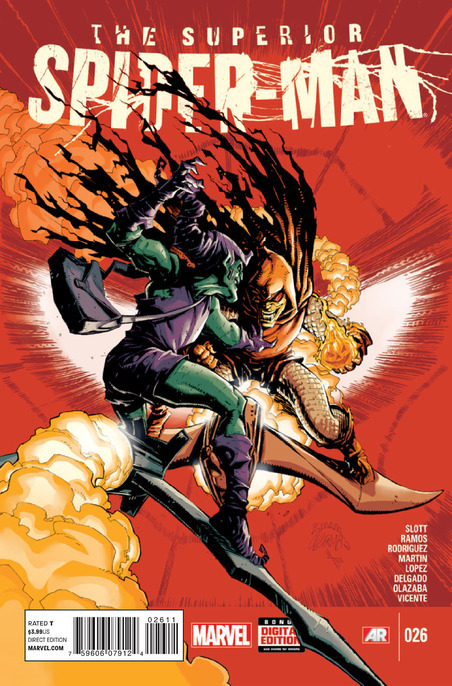 Great review, really enjoyed this issue, the fight between Green Goblin and Hobgoblin was really good. The combination of artist on this issue worked really well, and I also thought the mindscape sequences were excellent. Like I said, I don’t mind Ramos and Delgado in the way that many other fans seem to. But I tend to prefer a cleaner, brighter art style. I would love to see Martin back on the book, but I recognize he may be busy with The Private Eye. On the other hand, Rodriguez reminds me a bit of Paolo Rivera, so I wouldn’t mind seeing him have more issues. Now that I think of it, I’d like to see Ramos handle an action horror book. I think he’d be great on something like Legion of Monsters or Midnight Sons. He has this wonderful expressiveness to his art that shines when the story requires characters to have overblown emotions. I agree, would be great to see Martin back on the book. Would be great if Ramos were to do an action horror title, that would be superb.